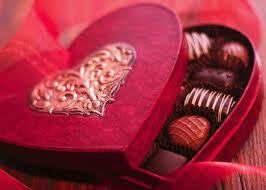 are you still indulging in bon-bons and sweet treats from your honey? These are the sweethearts that are offering up their eye candy on this, the final day. I decided to make a pillow for our boudoir. The maple leaves are a nod to my Canadian side and the crayons are for my boys. of snow we're experiencing this winter along with so many of you folks near and far. "it ain't over til it's over"! we're expecting more snow...20cm so they say! 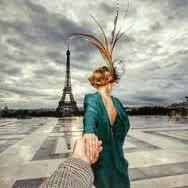 A Valentine scrappy trip !!!! How great !! Very pretty colors I would not have thought about that !! Glad you hopped on board!!! 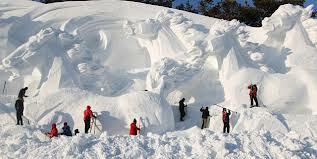 Love those snow sculpturess!! Beautiful Hugs & Kisses pillow! Thank you for sharing. Beautiful! 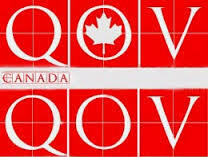 Love the FMQ! Thanks for sharing. Cute pillow! Thanks for sharing. What a lovely pillow! Cute! Have fun with the snow! What a fun little pillow! The first thought that popped in my brain....what an awesome take on the trip around the world pattern...LOVE around the world...then the more I looked at it....the more it looks like the heart is beating! Have fun and enjoy the snow...we've not really had enough snow to count this year. HI! 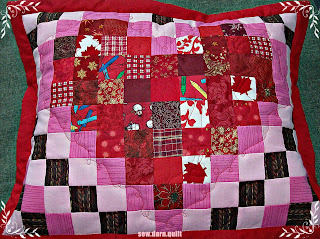 Carolyn, Your pillow is pretty with all the different fabrics.I love seeing the snow. We do get snow here but not where I live. Love the scrappy heart.....and the snow sculpture! Great project - thank you for sharing! Wonderful pillow. You created it in a thoughtful way. Just lovely. Rosemary B here: Dear Carolyn, I adore your pillow. It is so cute, but yes classy for the boudoir indeed! Good luck with that snow. I live in No Va and we usually get about 20 inches of snow but this year amazingly we have only had about 6 inches. They are predicting .... 1/2 inch of snow tonight. Holy Moly, why bother predicting anything for such a lame amount. I love your pillow! I also love that you included meaningful blocks symbolizing parts of your life. I wish you could send the snow my way!! You pillow is beautiful and colorful. I'll give it two wows! One for the work you did, and one for the sculptors! Cute pillow! What a great way to use up scraps! LOVE this pillow- what a tribute to your family! How sweet and it won't go to my hips! :-) Thanks for sharing! Beautiful pillow, enjoy the snow too! Thanks for sharing! Love your projects and the snow horses...wow! Hi!!! WOW!! Love your pillow!!! I love the little crayons and special pieces you put in!!!! Thanks for the snow pic of the sculpting!!! It is amazing too!! Thanks for the fun!!! Such a sweet Valentine pillow and the stitching around the heart is lovely. Thanks for sharing! Very cute pillow. Thanks for sharing. 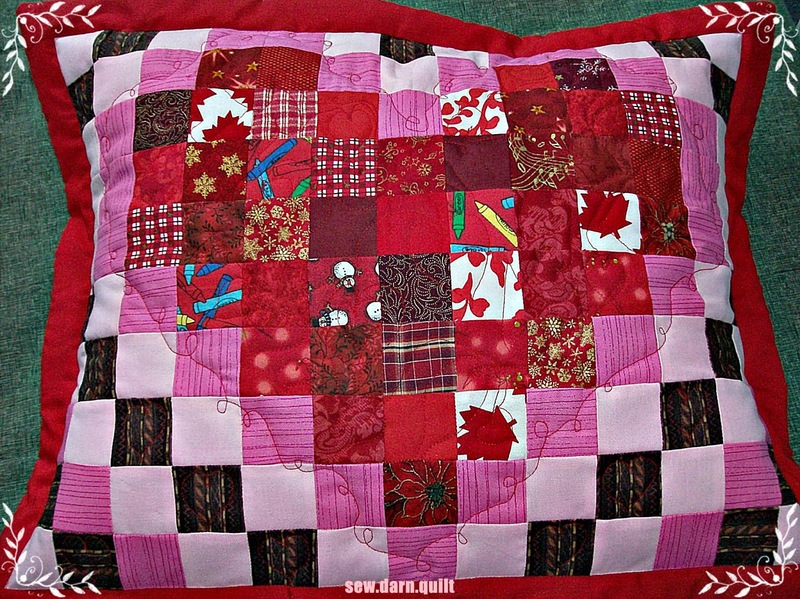 Your pillow is beautiful and by adding fabric pieces to remind you of certain things makes it very special. I like the quilting, too. You did a great job. Love the pictures of the snow. Living in the South, we don't see very much of it so I am so amazied by the amount everyone else receives.I would love to see enough to stay on the ground for at least 3 or 4 days. Wow is right! I love your pillow. It is stuffed with love! You pillow looks sew soft and squishy and comfy and lovely. Thanks for sharing. The snow sculpture is amazing! Cute valentin pillow, this has been a fun hop. Thanks for joining in and sharing. Pretty pillow - thanks for sharing. The snow sculpture is wonderful. I like your sculpture even better. The heart pillow is wonderful and I appreciate your using fabrics that have special significance to you. Great job. Thank you blogging and inspiring us. Looks like you had fun sewing this up, especially since you included little fun things to find like maple leaves and crayons. Thanks for sharing in the hop! Very cute Valentine pillow! Valentine's Day is sooooo much fun! Cute!!! Wow lots of snow for you:) Not here in Central Texas! Cute pillow! Today feels like Spring already here in Georgia. Thanks for sharing. What a cute, sweet, yummy, bon-bon pillow!! Happy Belated V Day! Great job...happy to see the Maple Leafs in the love pillow! That is very sweet. Thanks for sharing with us all! Your pillow is awesome. Great color choices. Thanks for sharing! Love the photo of the snow sculptures too! Great pillow! I love the colours and the special squares. beautiful! i love the colours you used in it are lovely! Eeps! 20 cm of snow? Yikes! I hope not! Hang in there! Love your pillow! Oh, I wish it would snow some here. That's a lot of snow, I can't wait to see what you start creating when you get back into goldsmithing (is that a proper word?)! Sweet take on the oh. so. popular. scrappy trip blocks! Thank you for sharing with us!